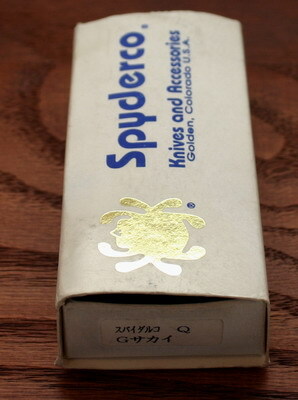 Nothing more compelling than an end-of-life sale on Spyderco.com. After some web-order confusion and a quick call to the SFO: Two additions to the house. One old friend: PE FRN cricket. I still can’t believe this one is going away. So light. So innocuous, yet useful. And one I have been curious about for a long time: SS ProGrip. You know how you have built-in cognitive biases about the relative size of an object based on previously-viewed pictures? Well the ProGrip is much smaller than I imagined. (as a counter-example the Military was much larger than I thought it would be) This is a pleasant suprise, I can actually see myself carrying this one a bit, even office-friendly. As has been observed in the forums: the Kraton is a double edged feature. The inlay on the handle is very nice, tactile, counterpoint to the stainless steel. However the kraton inside the clip? Hmmm. Nope. The ProGrip turns into a FanaticalGrip. This strip inside makes it really tough to get the knife out of your pocket! Perhaps this one will ride better in a belt-pouch. I finally upgraded to MT 2.661… no reason. Bad choice. Took all night. Made some very small tweaks to the site. I may yet change the colors. More to come… I’m going to bed and my eyes are loopy from staring at CSS. UPDATE: I tried some fixed formatting but it did not render correctly on Konqueror in Suse. Looked fine on IE6. So I’m going back to the variable width columns on the style sheet for now. At least it’s stable and working. In a recent frenzy of post-tax-refund madness, I decided to see what all this fuss was about the kitchen knives. 2 please, and fully serrated. I was skeptical about the serrations at first, but the blades are very thin, and the serrations are not deep points, therefore they work like a champ. Meats, veggies, packaged stuff, even tomatoes; these workers will probably see more cutting than all of my other Spydercos. Now if I can only keep the missus from throwing them in the dishwasher! Safe queen, that is. 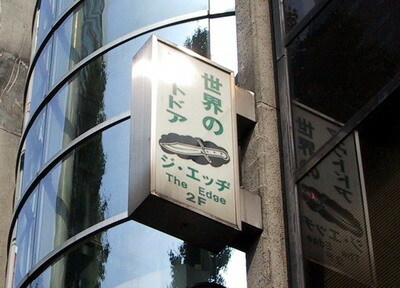 I have been to the shop in Shibuya many times. I round the corner from the JR station and walk the short distance up the hill. Aha! Many times have I gazed at the venerable, faded, nicotine-stained box. This time I pulled the trigger. Another Q! 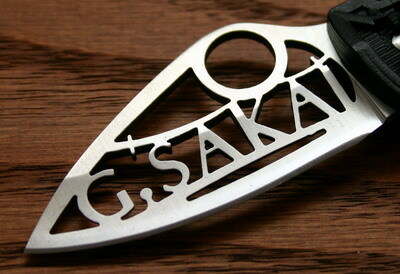 This one was made for G Sakai, purveyors of the highest quality sports-knife. Fairly rare but not the rarest. Even with the yen conversion it was a good deal. 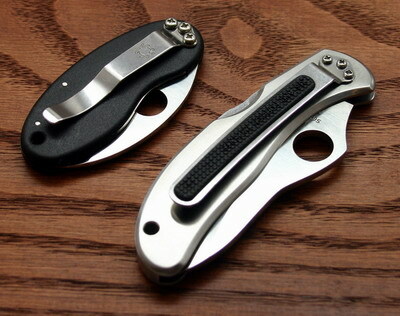 The Q is one of those painful collectors knives, you really WANT to carry and use. So light, so attractive (even to non blade-o-philes.) 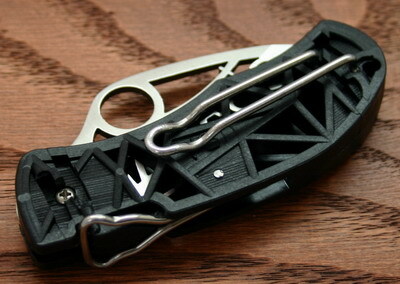 Clip is ingeniously convertible to left/right/up/down carry. But alas this gem will see no use. I noticed this one is better aligned on the lock bar than my plain old Spyder-Q. 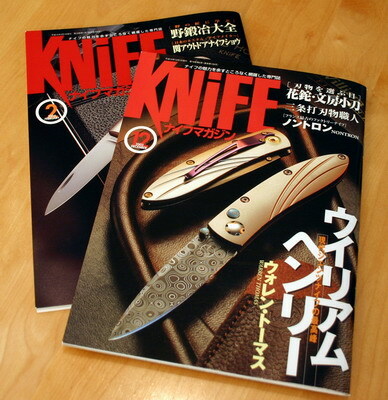 Another interesting find (sent on seek-and-acquire mission by Jurphaas) was the official knife magazine of Japan, called Knife. The photography is strikingly different than US magazines, dare I say the lighting is more Rorschach-esque (*gasp*, the hubris!) although much higher quality than my photos, these guys like to shoot in more subdued lighting with more shadows that play sensuously across the curves of the product. (slap! …sorry, marketing speak off) Anyway I cant read Japanese, but it looks like a really good rag. So until next time keep the white stones clean!